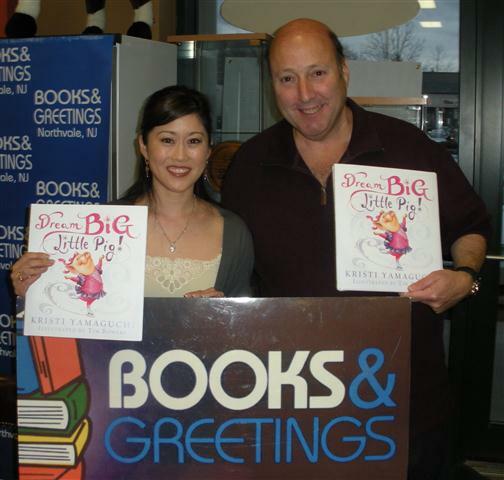 On Monday before an SRO crowd at Books & Greetings, Northvale, N.J., Olympic skating star Kristi Yamaguchi had a clean program promoting her new book, Dream Big, Little Pig! (Sourcebooks Jabberwocky). Here Yamaguchi appears with owner Kenny Sarfin. Total net sales of books in January fell 1.9%, to $805.7 million, as reported by 85 publishers to the Association of American Publishers. Continuing the pattern of the past year, digital categories had the biggest sales growth: e-book sales rose 115.8%, to $69.9 million, compared to January 2010. But the rate of growth for e-books has diminished from numbers so high they looked like typos. For example, a year ago, in January 2010, e-book sales of $31.9 million rose 261.2% over the same period in 2009, and, six months ago, e-book sales in July 2010 rose 150.2%, to $40.8 million, over July 2009. Still, e-book sales have grown so much that in January 2011, the category was larger than all other categories except for higher education and adult paperbacks. On the other hand, print sales still accounted for 91.3% of all January sales. You can see more on this from Publishers Weekly here. On the not so positive front is the latest from Borders. On Wednesday, Borders’ DIP filing was approved by the bankruptcy court. PW has a breakdown of the hearing here. But what is really interesting, imo, is the separate filing by Borders on Wednesday. Quoting from the same PW article: Borders contributed to speculation that it may look to a sale to emerge from bankruptcy. The court approved a motion appointing Jeffries and Company as its investment banker, but note that the company will only be paid under certain circumstances. “Jefferies shall be entitled to a Liquidation Fee with respect to any sale or liquidation of assets (whether pursuant to a Chapter 11 plan, Section 363 of the Bankruptcy Code or otherwise) if, and only if, Jefferies ran a sale process with respect to such assets and/or marketed such assets or investment concerning such assets and/or otherwise provided material services in connection with the sale or liquidation of such assets,” the order stated. Borders has also listed 28 more stores for closure. These stores will close by the end of May. Here is a link for the stores closing — I couldn’t get it to work this morning. Hopefully, it will later today. If not, here is a link to the PW notice about the closures. The dust is starting to settle, sort of, after the announcement that Borders finally did the inevitable yesterday. It filed for bankruptcy. It didn’t take long for journalists and bloggers — this blog included — to jump into the fray and try to figure out what this would mean to the company and to publishing as a whole. Honestly, we aren’t going to know the full impact for months, perhaps even years. There are some more details that started coming out about Borders during the evening and overnight last night. None of them are really surprising — well, that’s not quite right. One is, simply because I hadn’t thought about it before. So, I guess I’ll start with it. According to Shelf Awareness, the parent company for Borders in Australia and New Zealand filed for bankruptcy as well. They do note that this company, REDGroup Retail, has not connection with the U. S. Borders. The article notes that it will be “business as usual, but the paper [Sydney Morning Herald] called Borders’s and A&R’s outlook ‘grim. '” You have to ask yourself what it is about the overall philosophy of the Borders brand that might be behind the brand’s downfall. Back to the news that wasn’t so unexpected. While I don’t want to rain on the parades of those who have been celebrating the fact that their favorite Borders store isn’t on the list of stores slated to close under their bankruptcy filing, I have to point out that there is a separate filing by Borders which says the company may close an additional 75 stores. The same article notes that Borders posted a loss of something in the neighborhood of $168.2 million in 2010. If I remember correctly, it’s been something like 3 – 5 years since Borders has actually posted a profit. Reports on the causes for the bankruptcy range from blaming the economy to blaming Amazon, Walmart and e-books and everything in-between. I have no doubt that each of these did have an impact on Borders’ bottom line. You can’t deny the fact that e-book sales soared last year (164.4% increase in 2010 or $441.3 million in sales in 2010. December sales increased 164.8% or $49.5 million in sales.) according to AAP. The only other aspect of publishing to post a profit last year was audio downloads (up 38.8% to $81.9 million). Adult hard cover sales were down 5.1%. Trade paperbacks were down 2%m and mass market paperbacks declined 6.3%. Children’s books fell as well. Then there was their failure to jump into the e-book market until last year. That was bad enough. But doing so without a branded e-reader that was tied to their store was fatal, in my opinion. Sure, you can buy e-books from other stores besides Amazon if you have a Kindle or BN.com if you have a Nook, but you know you can always get e-books from those stores and those are the stores you first think of shopping at. Borders hasn’t posted a profit in years and yet nothing was really done to figure out, much less cure, the problem. As a result, thousands of employees will lose their jobs. There have been little to no consequences for those in the executive suite for their poor management of the company — at least not until it was too late. Unfortunately, the impact of the company’s mismanagement and bad luck goes beyond the company. The vendors — publishers and non-publishers — will feel the economic crunch. Even if they do manage to get some sort of payment as a result of the bankruptcy filing, it very well may be too little, too late. That will, inevitably, flow down to their employees and contractors. Then there are the customers who are losing an already all-too-precious resource — their local bookstore. And what about the authors and artists? They get little enough as it is from each book sold. That will may be cut even further because of all this. What started as an eddy is quickly turning into a whirlpool. Will publishing survive? Sure. But what it looks like when it comes out on the other side is up for grabs right now. Part 2 will go up later today. In it, I’ll dissect the letter sent to all holders of the Borders Reward Card by the CEO, Mike Edwards. The AAP (Association of American Publishers) has released the sales figures for October. I predict there are going to be some very unhappy bean counters sitting in their offices today trying to figure out what’s going on. Or maybe not. Maybe they will stick their heads in the sand, their fingers in their ears and do their best to ignore the trends, hoping the holiday season will save them. The trouble with that is it might be a short term solution, but it won’t cure what ails the industry. The only things that will are for the publishers to start accepting the fact that e-books are here to stay and their business models need to be adapted to reflect it AND they have to quit trying to drive the market with novels they think are socially relevant and give readers novels that entertain. Don’t get me wrong. There is a place for literature and “socially relevant” fiction. But it hasn’t been and, I think, will never be the money-maker they want it to be. There’s nothing wrong with fiction having a message, as long as you don’t hit the reader over the head with that message over and over again until they black out. Most people read for entertainment — the same reason they watch movies or TV. That is something we, as publishers, have to remember. Any way, for the figures. October wasn’t a good month for most segments of the publishing industry. Only four areas showed an increase in sales over those reported a year ago. Higher education books were up 12% over Oct. 2009. Children’s and YA hardcover books were up 13.9%. Downloaded audiobooks were up 20.7% and e-books were up a whopping 112.4% over October 2009. For the year-to-date figures, things don’t look much better. K-12 (kindergarten to high school) books are up 3.8% over the Jan – Oct figures for 2009. Higher education is up 10.6%, professional books up 8.4%, university press paperbacks up 4.1%, university press hard covers up 1.9%, downloaded audiobooks up 38.6% and e-books up 171.3%. Adult paperbacks were down for October but show no change for the month-to-date. Every other category has fallen. I know it’s small but, basically, the figures from 2007 to present are what are the most telling. In 2007, as e-book readers were beginning to hit the market, e-books represented 0.58% of the total sales figures for the year. That increased in 2008 to 1.19%. This corresponds to the release of the first generation of the Kindle in November 2007. in 2009, e-books sales increased to 3.37% of total sales and, in the first 10 months of this year, e-book sales represent 8.7% of sales. Digital downloads, whether of e-books or audiobooks, are here to stay. What is up in the air is how the major publishers adapt. If they continue forcing DRM onto their e-books and not listening to what readers want, it won’t stem the tide. At least not for long. What it will do is continue cutting into their profits and the livelihoods of their authors. Here’s hoping a happy medium is found soon, for everyone’s sake.